In the last several years there has been growing interest in using marijuana or its chemical components as treatments for a range of diseases and conditions. To date, the U.S. Food and Drug Administration (FDA) has approved three prescription drugs containing components of the cannabis plant, including two, dronabinol and nabilone, which contain delta-9-tetrahydrocannabinol (THC), the ingredient that causes people to feel “high.” In addition, numerous non-prescription preparations of cannabidiol or “CBD oil” are marketed as dietary supplements and promoted for use as remedies for chronic pain, arthritis, headaches, anxiety and other disorders. The latest cannabis drug to be approved by the FDA last June, Epidiolex, is a highly potent form of cannabidiol that does not contain THC. It was approved to treat seizure disorders associated with the very rare Lennox-Gastaut or Dravet syndrome in patients ages two and older on the basis of small studies that showed some effectiveness in reducing the frequency of seizures. Long before the first drug approval by the FDA, proponents of medical marijuana were advocating that it should be legal for medical use.https://www.drugabuse.gov/publications/drugfacts/marijuana-medicine. The marijuana plant contains chemicals that are believed, but not scientifically proven, to be effective in treating certain illnesses and symptoms. Off-label use has been promoted by medical professionals and lay persons for a range of uses including AIDS and cancer-related symptoms, migraines, anxiety disorders and multiple sclerosis (MS). The only FDA-approved indications for cannabis-based treatments in addition to Epidiolex, are to treat nausea in patients undergoing chemotherapy and to increase appetite among those with extreme weight loss associated with AIDS.https://www.drugabuse.gov/publications/drugfacts/marijuana-medicine. Dronabinol (Marinol) which has been on the market for two decades, is modestly priced and is indicated to treat these conditions. Given the narrow FDA approval for only a few conditions, off-label use is a concern. Off-label use for conditions for which the drug has not been scientifically demonstrated as effective could adversely impact patients by imparting false hope as well as pharmacy benefit spend and trend. While epilepsy is common, affecting 1.2 percent of the U.S. population, Lennox-Gastault and Dravet syndromes are extremely rare types of epilepsy that begin in infancy or childhood and are associated with significant developmental delay. The recommendation is to try conventional anti-seizure medications, which are only available as branded products, to treat the seizures associated with these rare conditions. Common seizure medications incluce valproate or topiramate, which are available as generics, or levetiracetam (Keppra). In the exceedingly rare cases of Lennox-Gastault syndrome patients can be treated with clobazam (Onfi or Sympazan). Epidiolex is now available as an option to treat those individuals whose seizures are refractory to conventional therapy. The cost for conventional anti-seizure medications is typically modest at pennies a day to less than $50 to $100 per month for generic drugs. Epidiolex was introduced at $2,708 per month.https://newfrontierdata.com/marijuana-insights/sticker-shock-gw-pharmaceuticals-epidiolex-really-expensive/. When determining appropriate Specialty Guideline Management (SGM) criteria for drugs with off-label use potential, it is important for payors to understand the impact on drug spend. Even though rebates may be available for the new brand, a new drug requires careful consideration to best meet the needs of plan sponsors. 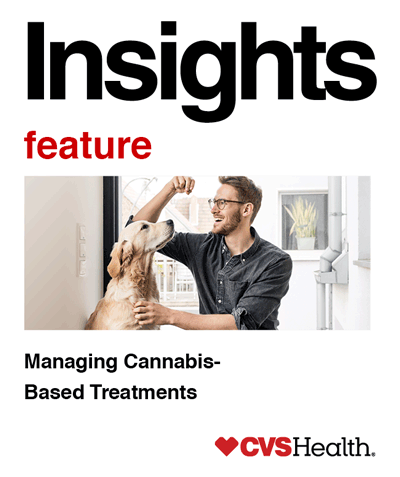 Given the marketing surrounding drugs containing cannabidiol, the very rare conditions for which Epidiolex has been demonstrated effective and FDA indicated, and the potential for off-label use, CVS Health recommends payors closely manage prescribing and use by implementing a robust specialty guideline management (SGM) criteria. While Epidiolex treatment provides options for patients, this does not signify FDA approval of marijuana or all of its components. At launch, CVS Health implemented a new-to-market-block for Epidiolex, pending clinical review. After careful consideration, we now recommend a confirmation of the specific clinical diagnosis and failure of conventional therapy before approving coverage for Epidiolex treatment. We recommend this, rather than instituting a process that would look solely for a prior prescription claim history of anti-seizure medication. Marijuana and its components are being studied as treatments for a range of other conditions including MS, pain, inflammation, substance abuse, behavioral health conditions, and autoimmune disease, and there is little doubt that more drugs derived from cannabis will seek FDA approval in the coming years. However, there is still much to be learned and the need for extensive research to prove safety and efficacy in different illnesses and conditions. In the meantime, it is important to help ensure that payors have appropriate cost management tools to address the impact of off-label use on drug trend while allowing patients access to clinically appropriate medications. It is important to mention that while this treatment provides options for patients, this does not signify FDA approval of marijuana or all of its components. CVS Health will continue to monitor this pipeline and proactively develop and implement management tools to help ensure appropriate use and drug spend and trend impact. Prior to launch, we seek input from external thought leaders to model potential impact. Our experienced clinicians will closely follow and evaluate the drug pipeline to determine appropriate formulary placement and potential designation as a specialty drug. Our integrated PBM and specialty pharmacy model helps lower medical and pharmacy costs, improve outcomes and create a better member experience. This article contains references to brand-name prescription drugs that are trademarks or registered trademarks of pharmaceutical manufacturers not affiliated with CVS Caremark. Image source: Licensed from Getty Images, 2019.